To celebrate Thanksgiving, we thought it was only fitting that we, the people behind Homes for Heroes, share what we are thankful for this year. But, before we get to what we are all thankful for, we would like to give thanks to our nation’s every day heroes. You are appreciated more than you know! Luke, Director of Marketing- “Ok say it’s cliche, but honestly, I am most grateful every morning….when I wake; when I can get up and start a brand new day with a fresh cup of coffee. The house is quiet because I’m up before everybody else. Often times I can watch the three neighborhood chickadees who frequent my bird feeder nibbling away at seeds, and all of it reminds me how good it is to be alive. “This is the beginning of a new day. God has given me this day to use as I will.” – If you’ve never heard this poem from Coach Bear Bryant, listen to it now. It’s a good one. Each day is a blessing, regardless of the outcome. Even if sometimes I prefer to re-write it, the day was still mine to have and live, and I’m grateful for every opportunity to do so. After my wife and I celebrated the birth of our new baby boy this August, we experienced some difficult challenges. Sarah was unable to walk, relying on a wheelchair to get around for over a month. She then improved and was able to use a walker. Today, she is using a cane. She’s getting around better, but her legs are weak. She attends physical therapy 2x each week to regain her strength. Unfortunately, she’s still unable to walk while holding our baby boy, and emotionally that really hurts her. It’s been very challenging, but I can see she’s getting better, making strides to full recovery and I try not to think about what if she doesn’t fully recover (which is possible). 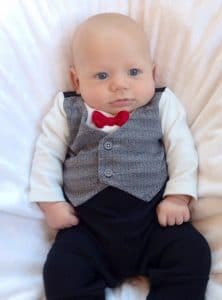 I’m thankful for her improvements, the gift of our new baby boy Reid (here in his vest and bowtie – young chap) and all the moments we’ve been able to share together along with my two kids, Clara and Carter, as a family. Through it all, I believe our love as a unit has grown exponentially, and I’m extremely grateful for the strength of our bond. I’m extremely grateful for the never-ending support and assistance we’ve received from friends and family. Sarah’s mother watches over both her and Reid while I’m away, working to pay the bills. Other family members or friends bring food, help clean, and drive them to numerous doctor appointments throughout the week; bringing a whole new meaning to “it takes an army.” I’m not sure how things would have gone if Sarah and I were left to handle these challenges on our own. We’re beyond blessed to have these people in our lives. I am thankful to have a full-time job, doing what I enjoy (marketing), at a company I admire (Homes for Heroes), and working with people who have prioritized making the lives of others better. It provides financial stability for me and my family, in addition, it also provides me a method of giving back to people who have given their service to others. The core of Homes for Heroes, who we are and what we do, is extremely important to me and I am grateful to be a part of it.